George Washington Carver was a talented and accomplished African American inventor, born in a time of slavery. His parents were Mary and Giles, a couple owned by a German American immigrant named Moses Carver. The exact date of his birth is not known, but it could either be 1864 or 1865. When George was still a new born, he was kidnapped along with his mother and sister by marauders. Moses Carver hired a representative to find his slaves on his behalf but the only one who could be recovered was George. When the end of the American Civil War brought about the abolition of slavery, Moses and his wife Susan decided to keep George and his brother James with them. Susan Carver taught George to read and write at home as there were no schools for black children at the time. After staying with the Carvers for some time, George decided to leave home and travel to Neosho, 10 miles away from the Carvers’ home. There was a school for black children set up there where George hoped to be admitted. He reached there at night when the school was closed so he slept in a barn. The next morning, he met a woman named Mariah Watkins, whom he later described as a kind person who allowed him to rent a room and encouraged him to gain a good education. He changed his name from “Carver’s George” (which was how he was referred to during slavery) to George Carver. After spending some time at a number of different schools, Carver received his high school diploma from Minneapolis High School in Kansas. He got admitted to Highland College in Highland, Kansas but when he reached there the administration refused to let him enroll because they hadn’t realized he was a black student when he had sent in his application. Making use of the Homestead Act, Carver claimed a piece of land where he conducted biological experiments, and set up a small conservatory growing different plants, flowers and crops such as rice, corn and fruit. He then took a $300 loan to study music and arts at Simpson College in Iowa, and later transferred to Iowa State Agricultural College where he studied botany, being the first black student admitted at the institution. Carver completed both his Bachelor’s and Master’s from Iowa State and excelled at his studies. After graduating from Iowa, Carver’s excellent reputation in the field of botany and agriculture caused him to be immediately hired by the Tuskegee Institute as a professor. The principal at the time was Booker T. Washington and he offered Carver an attractive salary and an apartment as incentive to join the institute. Carver assumed leadership of the botany and agricultural department, where he reshaped the curriculum and helped the department and university to reach national acclaim. His research and training helped former slaves to establish a prosperous system of crop rotation and secure themselves financially. He devised a “mobile classroom” to tour the countryside and impart knowledge to struggling farmers. Another claim to fame was Carver’s research and experimentation towards discovering alternative uses for crops such as soybeans, peanuts, pecans, and sweet potatoes. He found hundreds of uses and invented a wide range of products including paints, plastics, dyes and even fuel. He came to be identified amongst the top intellectuals of the country and was even consulted by President Theodore Roosevelt on agricultural issues. He was an advocate of racial harmony but was never actively involved in politics himself. Instead, he dedicated his life to conducting research and spreading knowledge. He was responsible for improving the station of countless freed slaves previously living in economic oppression, by teaching them scientific methods of farming that would yield the best results. 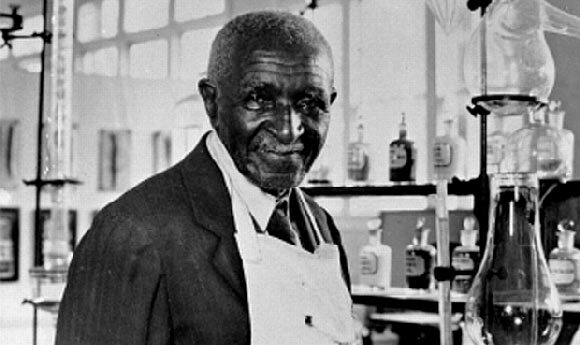 George Carver died in 1943 at the age of 78 and was buried on the Tuskegee grounds next to Booker T. Washington. With his savings, he had established a museum devoted to his life’s work, which unfortunately caught fire destroying all but a few of his paintings. He had also set up the “George Washington Carver Foundation” at Tuskegee to support agricultural research. A national monument was dedicated to him including a statue of him, a nature trail, a museum and a cemetery. This was the first such monument built in honor of a black man, who was and remains an icon of African American achievement since the abolishment of slavery in America.